John Engels was born in South Bend, Indiana in 1931. He was a professor of English at Saint Michael’s College in Colchester, Vermont for 45 years and published eleven collections of poetry. Among his books are, Cardinals in the Ice Age, which was a National Poetry Series selection in 1986 and Weather-Fear which was a finalist for a Pulitzer Prize in 1984. He died in June of 2007 but left us a remarkable body of work. Forever back, clutching my stone, my gun, my light. In this, he tries to scrape away layers of false comfort and face the bare terrifying fact of imminent death, the dead raging animal desire we all feel to howl against the abyss. “Bullhead” is an amazing example, the poem’s central comparison pivoting on a gaping catfish writhing for hours in his bucket after being caught and his own desire to “cry out/into the blackness beyond/the dumb immediate blackness” his own breath like a hook “snagged/in my gullet, the tongue/in my mouth like a worm.” Since, as he says, the agony of this end is connatural, he is dumb, mute—we are all mute against it. But there is also a heroic aspect of facing the danger for the beauty of the fleeting natural world, as in “Aurora,” “Earth Tremor, the Sky at Night; or “At the Top of Blood Mountain.” Although this last poem has ambiguities of lineation that leave one wondering about the nature of the fixed still point upon which the end pivots. There are some excesses in his poems. Sometimes he overly explains things, not allowing the implied connections to remain implied, as, for instance, in “Barking Dog.” He doesn't do this every time, but it does happen. Occasionally his syntax can become winding and treacherous, overextending lines. Sometimes he splits complex subjects and interjects prepositional phrases, such as in “The Hunters” or “Anniversary.” It sustains the movement of the poem, although, occasionally, at the cost of clarity. Ultimately, in spite of any shortcomings, I would recommend him for his images and diction, his sharp insights and affinity for what he observes. He is a poet deserving of much more attention than he receives. The force of his themes punches you in the metaphysical gut while his linguistic textures are as delicious on the tongue as a piece of warm, buttered bread. His poems are constructed from the same dust of the earth from which man was made. Discussing her new collection What Matters. Michael T. Young: Given that your new collection What Matters is focused around surviving cancer and how memory connects with that survival, I wondered if the poems were written independently or with the intention of making a coherent collection. What is the history of its genesis? Adele Kenny: Before I answer, Michael, here’s a big THANK YOU for the time and attention you’ve given What Matters. So lovely and generous of you! 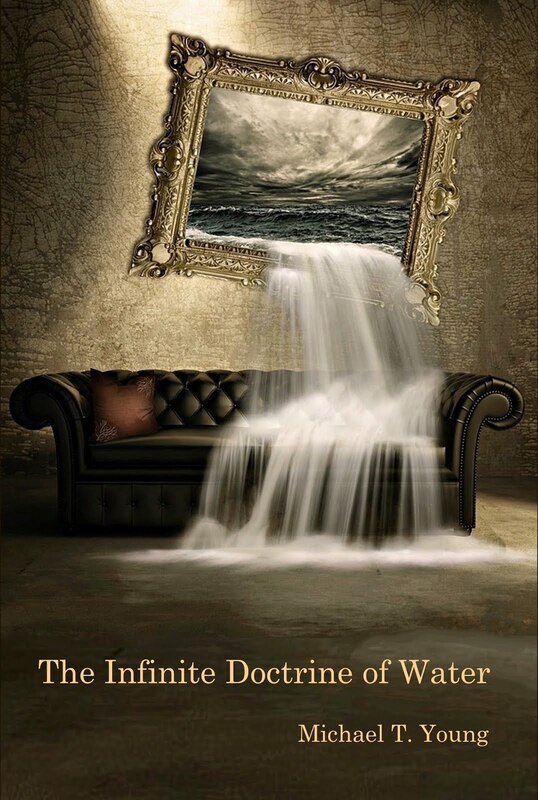 You asked about the genesis of What Matters … Interestingly, the collection had a title before it became a book. I had been writing the poems independently for about ten years, not thinking of them in terms of anything but individual poems that were difficult but healing to write. Like many images in the poems, the title came to me late one night. I woke up the next morning knowing that What Matters would be the title of my next book. But what book? That day I took a long look at my newer poems (revised, written, and in process), and the title powered the process of writing, tweaking, and selecting. A number of poems didn’t make the cut, and a few of the poems that first appeared in Chosen Ghosts were reworked for What Matters because they were part of a “story” that overlaps from one book to the other (just as life experiences sometimes overlap). What Matters is a book about survival and the fact that we’re all survivors of one thing or another. The details may be different, but we’re all survivors. My goal was to create a collection of poems for the collective heart as well as for the personal. Michael T. Young: In the poem “Coming and Going” you write “You count/your losses, the wounds that//are yourself.” What relationship do you see between what we suffer and who we are? Adele Kenny: I’m so glad that you picked up on the relationship aspect in this poem. In my life, the challenges have, in large measure, defined (and continue to define) who I am. I’ve come to believe that a purpose of suffering is discovering a relationship with it and understanding its causal effect on whether or not we become bitter or grateful. Michael T. Young: The Poem “East Rahway” says “The past falls like water from winter boots.” And the poem “Tending the Graves,” opens with “The snow has melted, the stream remembers/how to be a stream.” These poems suggest how memory is connected to the flow of time. I wondered what you saw as the implications of this connection. How does it affect who we are and how we live? Do you see memory as a kind of redemption from the loss that time imposes? Adele Kenny: I believe that painful memories (loss, grief, illness, failure) contribute to our survival toolboxes, and we need to carry those memories with us because they strengthen us if we let them. Good memories reassure us with hope. Most importantly, memory is what lasts—our backcloth, a sustainable “place” despite the passage of time—a shining, silvery thing that becomes redemptive and holy. Michael T. Young: Certain images such as starlight, rain, and shadow reoccur throughout the collection. Was the movement of such elements a conscious symbolism or an unconscious language you recognized while organizing the book? If these are elements you reflected on, what do you see as their significance in the collection? Adele Kenny: And wings! And light! The recurring images (mostly from nature) surprised me at first. Their presence is organic (not deliberate), definitely the work of a spiritually-charged language that I feel more than hear. Often, they look toward nature’s power and human connections to the natural world. In many cases, those images buttressed the poems in which they appear with a sense of “belonging” to other poems in the collection, of “belonging” to a larger world than the book. Michael T. Young: In the poem “In Memory Of” you write “In that voice/without margin, the notes I remember most/are high and low.” What role do you see opposites or extremes playing in memory or life in general? Adele Kenny: We live between extremes much of the time, but extremes of love and loss and grief are what we remember most. 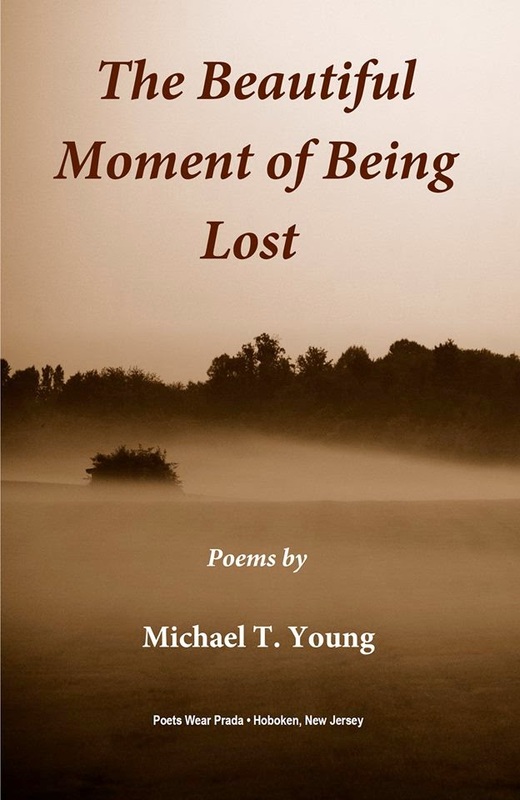 Michael T. Young: In the prologue poem “This Living” you write “It’s not destination, but more what silence is when/you enter it deeply.” Silence and also stillness are present in other poems in the collection. What significance do you believe these qualities have? Are they spiritual, philosophical, something else? Adele Kenny: Peter Minard (a contemplative Benedictine monk) wrote, “Real Silence begins when a reasonable being withdraws from the noise in order to find peace and order in his inner sanctuary.” The world’s “noises” trouble me and, often, I enter the silence and stillness of my “inner sanctuary” through poetry and prayer. I don’t have a label for it, but my process of writing is similar to my process of prayer. Michael T. Young: Do you have a favorite poem in the collection? If so, which is it and what makes it significant for you? Michael T. Young: You are the author of 12 collections of poems. In what ways do you see your art as having changed and evolved over that time? Adele Kenny: Imagery and sound have always been in the same craft-arc for me—that’s never changed, though I like to think that my command of imagery and sound has become stronger. I really don’t think about what I’m doing when I begin a poem and, most of the time, I have no idea where a poem might go. I don’t plan the poems, I just write. Later, I tighten imagery and work more consciously on sound (ways to make “music” with the words). In recent years, my poems have become deliberately shorter—more focused and compressed. Now (and I don’t recall ever thinking about this in my earlier work), I want my poems to say more than I planned for them to say. I want them to tell me something about myself, something I haven’t learned yet or something I’ve forgotten. I want them to startle and surprise me. I want them to express my astonished love for all created things, for all of life (“this wing, this living”), and I want them (always) to praise God. Michael T. Young: On your blog, The Music In It, you often provide prompts for poets. Do you find prompts helpful for your own writing? If so, how do they serve you: as regular ways to find new material, as ways to escape writer’s block, just another way of getting started, or something else? Adele Kenny: I’d been writing prompts for years to use in workshops, and they were always well received, so when I thought about blogging (and knew that I didn’t want to do an “about me” blog), I decided to offer a prompt each week for other poets to work with. There are times for all of us when “gift” isn’t enough, when the muse heads for an airport and disappears, and we need a jumpstart. That’s how I see prompts—jumpstarts for those times when gift and talent don’t carry us—you know, when the battery goes a little dead and we hook up the jumper cables to get things going. Adele Kenny: A prose work that has influenced my thinking about poetry (and my thinking in general), is Thomas Merton’s New Seeds of Contemplation—chapter fourteen (“Integrity”) in particular. The chapter begins, “Many poets are not poets for the same reason that many religious men are not saints: they never succeed in being themselves.” There’s an important suggestion here about developing our own styles. But to answer your question about stylistic influences, I can’t think of a prose work that has specifically influenced my poetry style. Poets and their poems—that’s another angle! I’ve been influenced by many poets, though I try not to be. I’m especially drawn (again and again and again) to T. S. Eliot, and I’ve just written a poem in the style of e.e. cummings for the fun of it (a large grin here). Michael T. Young: What are you working on now? Do you have another overarching subject set for your next collection? Adele Kenny: I’m working on some new poems but without a theme or specific direction. The joy for me lies in the process of writing as much as in the finished poems. Right now, I’m not thinking of a book (but I won’t say “no” if one begins to appear). Adele Kenny: My mom taught me how to read and write when I was four and sick in bed with what was diagnosed as “polio fever.” It was a tough summer for both of us, but somehow or other my mom (not a trained teacher) figured out ways to teach me to read and write using poetry and St. John’s Gospel. So, poetry, as something I do, goes way back, and even when I’m not actively writing, there’s always a word or an image or a line in process. 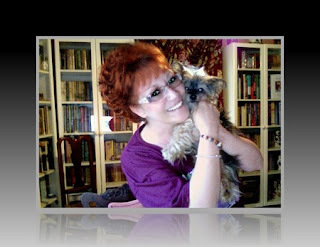 That said, I love genealogical research (I’ve traced my English ancestors back to the time of Elizabeth I), book collecting, gardening, forests, antiques, and for the past thirty-five years I’ve raised Yorkshire Terriers—Dylan, Yeats, Bijou, and now my new little guy, Chaucer. Michael T. Young: Thank you, Adele. Let’s close with one of your poems, your favorite from the collection. deep in memory’s birthwood calls me back. The past is my first language, a speakable grace. went to sleep with the easy grace of children. grandmothers weren’t only foreign but deaf. and propjets taking off on runway number three. games, no little league, no one drove us anywhere. moon above us, cloud-ribbed in semi-silhouette. The past falls like water from winter boots. that we tossed like dice to tell our future. What Matters is Adele Kenny’s twelfth poetry collection. 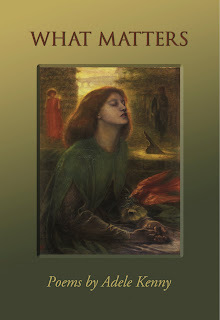 Its poems are a beautiful balance of music and thematic sensitivity. The collection is composed of 3 sections, the middle one being that in which she confronts the difficulty of surviving cancer. The 2 flanking sections, “Where Memory is Holy” and “We Don’t Forget,” suggest that the power of memory and not survival is the main subject of this collection. Of course, the truth is that it’s the relationship between memory and survival that is intimately explored throughout. These poems are a real pleasure to read. For the first time in a long time, I was struck by the simple enjoyment of an alliterated line, such as “At dusk, deer feed in a corner of the field.” Or “The sound rattles and rings—far from the/sea, from the stone circle” or, one of my favorites, “flung from the sun’s infallible fist.” There is also the beauty of internal rhyme such as “your heart skipped and flipped, lungs/strung like pebbles on wire.” Kenny, of course, uses more subtle techniques. She is clearly a poet with an ear trained to the beauties and subtleties of the music in our language. But she is also adept at articulating themes with striking imagery and keen sensitivity. logic and never quite lost. light in which it casts no shadow. the dead tree’s shadow that stretches upstream. Always, then, the old angel wheezes in. As we survive this confrontation with mortality, that faculty which connects us with all of life revives, even in the middle section. In the poem “And Nothing Less,” Kenny says, “her dreams want her back.” Surviving the cancer is not a sudden epiphany, as survival never really is, but a gradual return to the light, a slow dawning. The final poem in this section returns memory in full where the speaker looking at a jay making noises at a squirrel, “reminds me of when I was five and//something died in our drain spout.” Surviving means returning to memory, finding life echoing, resonating with other moments. That’s how survival contrasts with living. In the middle of survival, the moment resonates with nothing, there is no echo. how it feels to rejoice. What Matters is a collection that confronts darkness and the fear of death without being ponderous. It offers hope and light without being insipid or sentimental. More than my brief review can detail, it explores the complex point at which memory and mortality, identity and death are intimately connected. And this is all accomplished with a music and imagery that will please any reader.